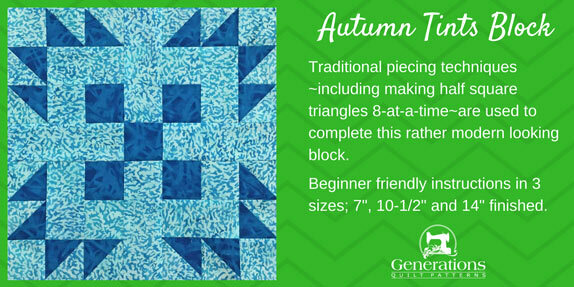 Our Autumn Tints quilt block uses traditional piecing techniques—including making half square triangles 8-at-a-time—to complete this rather modern-looking patchwork design. Lots of negative space to play with! Step-by-step instructions to make the block. Pressing directions are always included to make construction as foolproof as possible. Two contrasting fabrics are all you'll need for your own Autumn Tints. 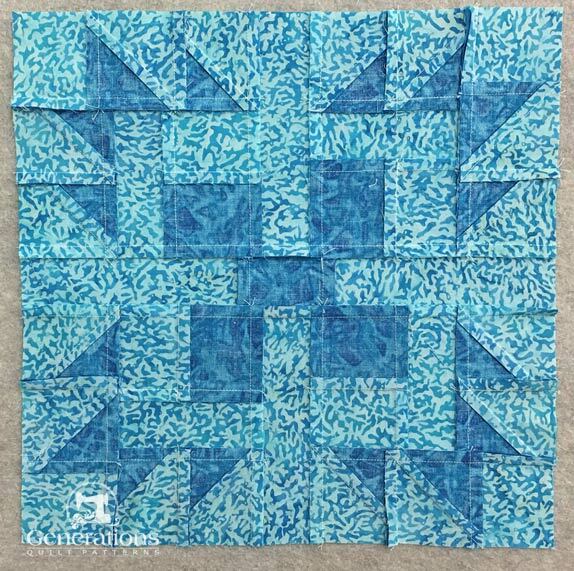 Don't forget to Pin this tutorial for later if you don't have time to quilt today. 1/4" SAs are used throughout this tutorial. 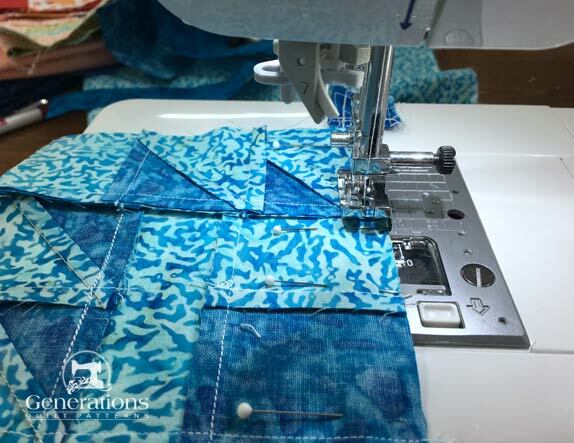 When instructed to press, press the patches in the closed position first—just as they came off your sewing machine. This sets the seam, melding the fibers of the thread into the fibers of the fabric. Starch makes everything easier—in my opinion. A 50/50 mix of StaFlo Liquid Starch concentrate to water is my favorite recipe for truly stable patches. Other quilters prefer Best Press. Use whichever works best for YOU. Two fabrics are all you'll need. To ensure that all your sharp points will show after piecing, choose fabrics with high contrast. While the fabrics chosen for the sample are pretty together (the block is more vibrant in person), a couple of points aren't as pointy looking as they could be. That's because the same color in the same value is in both the light and dark fabrics in our Autumn Tints block. It's always a good idea to make a sample block to test your choices! After cutting label your patches. 1	 Light	 2	 4 1/4"	x	4 1/4"	 5 1/4"	x	5 1/4"	 6 1/4"	x	6 1/4"
2	 Dark	 2	 4 1/4"	x	4 1/4"	 5 1/4"	x	5 1/4"	 6 1/4"	x	6 1/4"
3	 Light	 8	 1 1/2"	x	1 1/2"	 2 "	x	2 "	 2 1/2"	x	2 1/2"
4, 7	 Dark	 5	 1 1/2"	x	1 1/2"	 2 "	x	2 "	 2 1/2"	x	2 1/2"
5	 Light	 4	 1 1/2"	x	2 1/2"	 2 "	x	3 1/2"	 2 1/2"	x	4 1/2"
6	 Light	 4	 1 1/2"	x	3 1/2"	 2 "	x	5 "	 2 1/2"	x	6 1/2"
Unfinished Block Size	 7 1/2"	 10-1/2"	 14"
Grid Size	 1"	 1 1/2"	 2"
Like the block but not sure what to do with it? 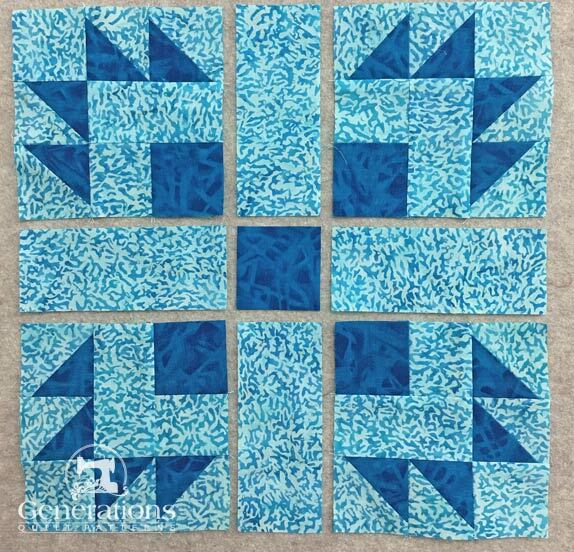 We use the 8-at-a-time method to make the 16 HSTs needed to complete this design. 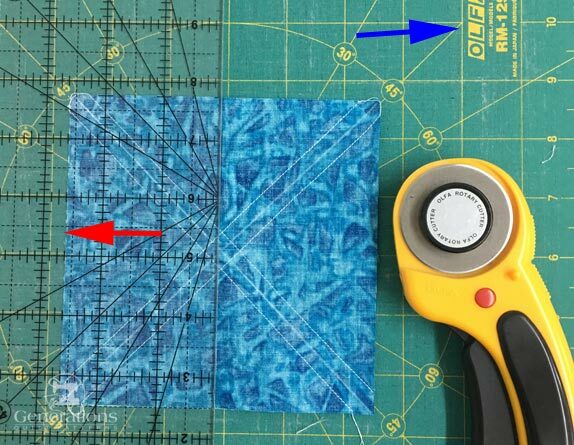 If you're making many blocks, you might want to try triangle paper for even more efficient piecing. To begin, draw two diagonal lines on the back of either the large #1 or #2 squares. You can barely make out the chalked diagonal lines. They only need to be as dark as YOU need to see them. My favorite mat for trimming HST—very efficient! 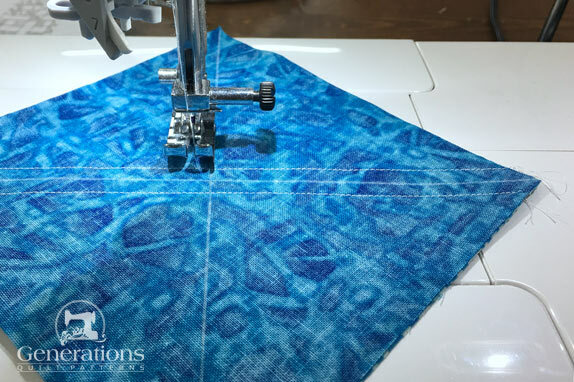 After stitching give your sewn pairs a good press, then move to your cutting mat. I use a rotating mat for easier trimming. Just load it up with HST and trim away. Using the chart below, find the finished size of your block and the corresponding Center or Midpoint Measurement. For our 10-1/2" sample that measurement is 2-5/8". 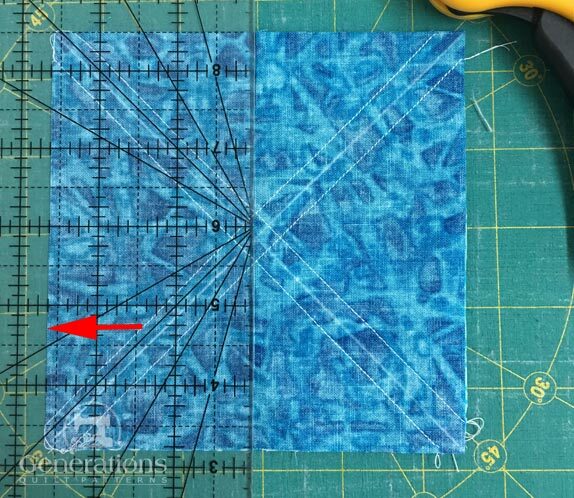 Find that measurement on your ruler and align that line with one edge of one sewn pair (red arrow). The edge of your ruler should be in the middle of the block. Cut through the center. 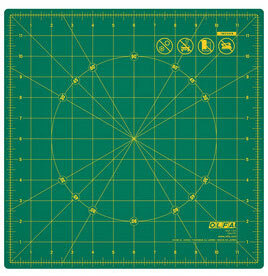 Turn the mat a quarter turn (this is where the rotating mat is so nice—there's much less disturbance of your patches. Align the Center measurement with the edge of your pair of patches and cut through the center again. You now have four equal squares. The blue arrow shows that the orientation of the mat changed when you rotated a 1/4 turn. Cut the square apart on the diagonal lines to form the HST. Because your squares haven't moved these cuts are quick to make. If you've not disturbed your patches, you'll be able to use your rotary cutter for these last two cuts. Repeat for the second sewn #1/#2 pairing. Press your HST with SAs towards the dark. 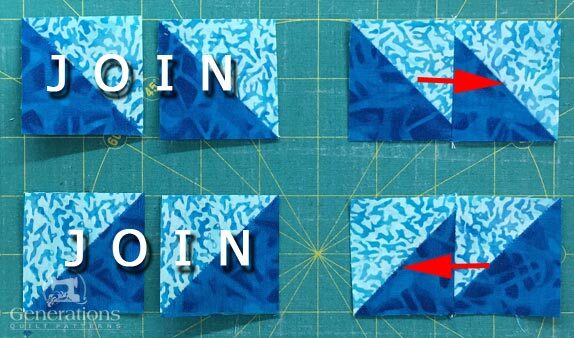 Referring to the chart, find the 'Trim to...' size that corresponds to your block and trim your 16 HSTs to perfection. 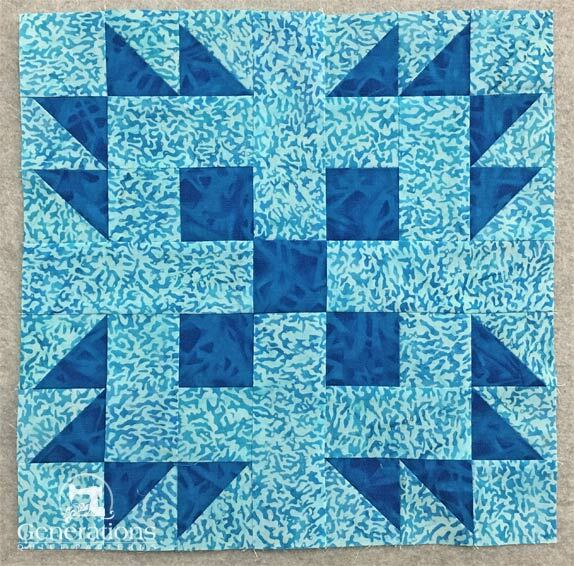 For our 10-1/2" sample, the HSTs are trimmed to 2"x2". Before (left) and after (right) trimming to size. To complete our Autumn Tints block, you'll need four pairs each of mirror imaged HST duos. With RST, stitch pairs of HST together so that 4 pairs have dark HSTs that slope down to the right and 4 pair that slope down to the left. ...yes, I pin these so that the edges stay even. SA are pressed toward the dark fabric as shown below (red arrow). You'll need 4 each of #3, #4 and #5—it's a good thing you labeled your patches. With RST, join four #3s and #4s together. Press the SA toward #4. With RST, join the #5 to the pair. Use the picture below to make sure that the patches are joined exactly the same manner. You'll want the #5 on the left side with #4 in the upper right corner after sewing. Press the SA in the direction of the red arrows. Compare the dimensions of your units at this point to the chart below. Make any needed adjustments. 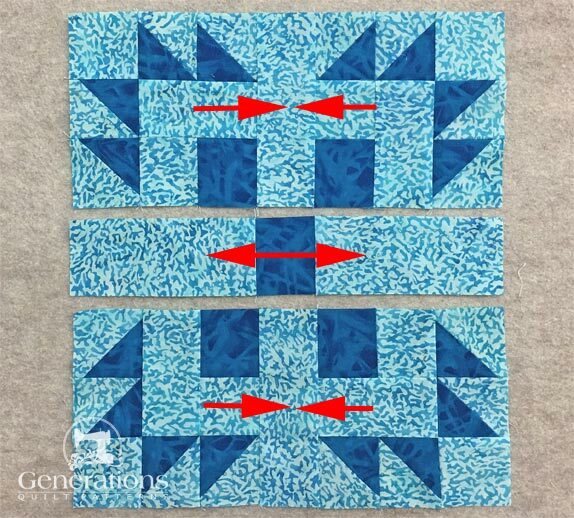 To complete the corners, arrange the sewn HSTs, a #3 patch and a #3/#4/#5 unit as shown below. With RST, join the units, pressing SAs in the direction of the red arrows after each seam is complete. Check your dimensions against the chart below, adjusting if necessary. Arrange the pieced corners and cut rectangles and square into the Autumn Tints design. The corners are positioned with the dark square towards the center of the block. With RST stitch the units together in each row. After sewing, press the SA in the direction of the arrows. With RST, sew the rows together. 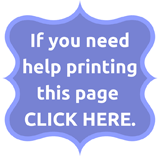 Here I'ved pinned to help keep all the edges even. It's easier that way to pay attention to your quarter inch seam at the points of the HSTs. Note, too, that the side with the most piecing is on top to minimize Twisted Sister seam allowances. After sewing and pressing, this is the finished block—loving all the extra negative space in this design. 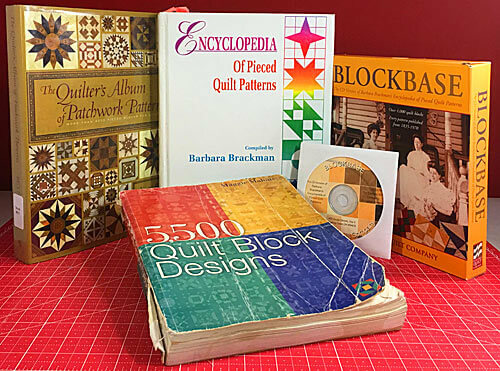 If your block doesn't want to submit in pressing, try my favorite pressing technique for impeccably flat finished patchwork! To reduce bulk, these last two SAs are pressed toward the center. After that final press, this is the Autumn Tints from the backside. For inspiration for laying out your Autumn Tints quilt blocks, click here. 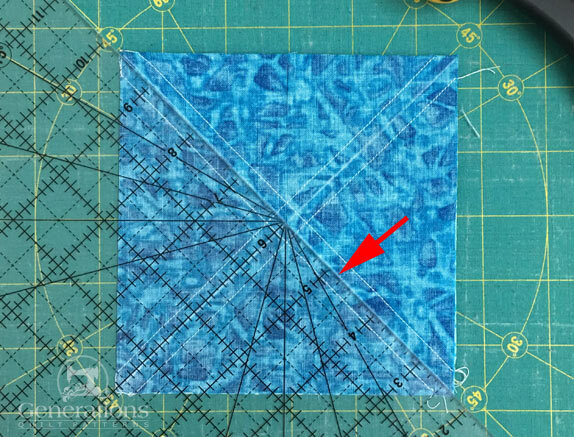 If you're a scrap quilter and want to use this pattern for a bonus quilt, click here for the converted cutting chart.